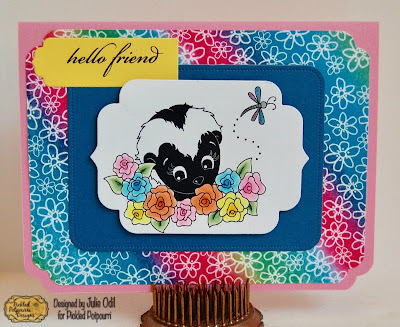 Pickled Potpourri Designs: Hello Friend! 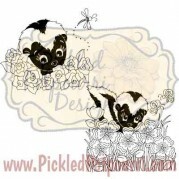 Skunks, flowers, and a dragonfly. This one digital stamp has it all! 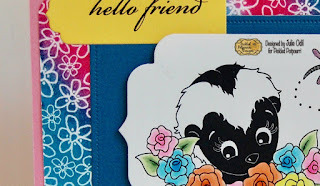 I found this super cute stamp set in the Pickled Potpourri Online Store, along with a wonderful sentiment, found in another great set. The digital stamp set is Shy Skunks, colored with Copic markers. 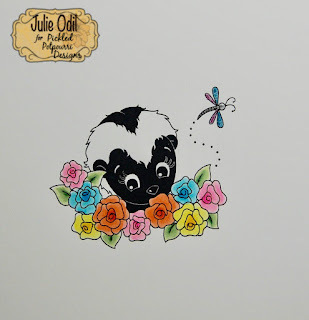 I used some metallic gel pens on the dragonfly and decided not to color the skunk. I though she was perfect just the way she was! 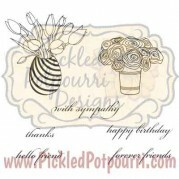 I hope you check this blog often for great inspiration from the Pickled Potpourri design team!